Interra's memory design platform includes MC2 and Touchstone frameworks for developing and characterizing embedded and custom memory compilers. The production-proven MC2 and Touchstone products are widely used by the top semiconductor companies, SoC design houses and foundries. MC2 automates the design process for standard and embedded memories. MC2 also provides a platform for seamless migration to new processes. By enhancing the overall methodology for the design and distribution of memories, MC2 ensures the reuse of a base design over many generations of sub-micron processes. Numerous users have taken advantage of MC2 capabilities for scaling their memory designs to higher densities, placing memories within their SoC, ASIC or IC designs, and making their memory design process more efficient. Manual methods of performing Memory Design are time consuming and error prone. More so, manual checks for errors and multiple regeneration of memory behavior requirement affect productivity and time-to-market. 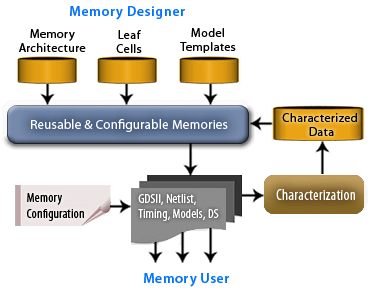 Designers need a tool that is capable of automating the process of characterization and verifying the memory based on required memory behavior. 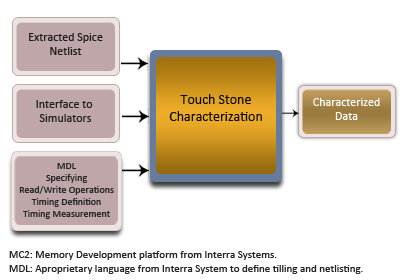 Interra’s Characterization Systems called Touchstone automates Memory Design to rapidly provide accurate timing and power models for simulation, verification, and synthesis. Touchstone enables designers to quickly and accurately validate memory architectures that are high in performance and low in power consumption. Easily programmable, Touchstone comes as a user-friendly platform to describe and characterize memories. Further, Touchstone can be easily integrated with MC2, Interra’s comprehensive memory development platform. Touchstone is available on Solaris and Unix platforms.